An educational outreach program of the State Historical Society of Missouri, in partnership with the Missouri Humanities Council, National History Day in Missouri (NHDMO) is an innovative opportunity for sixth-twelfth grade students. They conduct extensive research on historical subjects and present findings their way through documentaries, exhibits, papers, performances, or websites while building confidence, independence, and critical thinking skills. Statewide, over 3,000 students participate each year. Nearly 600 advance to the state contest at the University of Missouri-Columbia in April, and top winners in each category serve as Missouri delegates to the national contest in College Park, Maryland. 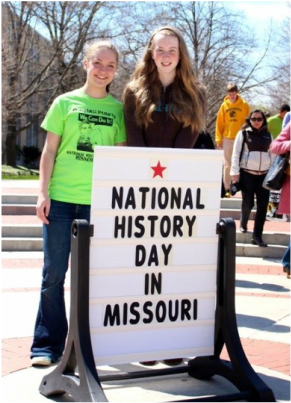 Support National History Day in Missouri! We invite you to join us in our continued work to put more Missouri students in charge of their education while reaching over 10,000 people each year. We have a variety of support opportunities available, and we are excited to partner with you. Together we will increase the number of Missouri’s excellent projects, inspiring stories, and future leaders. Recognized at the State Historical Society of Missouri Annual Meeting, with two complimentary tickets for representatives to attend and speak for one to two minutes. Support National History Day in Missouri by providing products and services that promote NHD’s mission and extend the program’s reach.